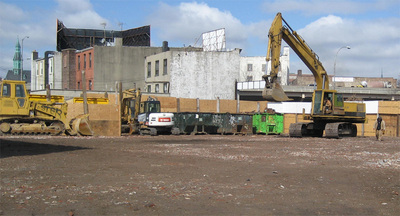 This is the now empty lot that's behind the Kellogg's Diner on Keap Street and Metropolitan Avenue (to see the image full sized click here). Being located next to the second stop of the L train one can only guess that more luxury housing is on the way. Next door to this location is a building which use to house a gallery and now is also going condo too. This page contains a single entry from the blog posted on April 7, 2008 12:26 AM. The previous post in this blog was Traveling Amp. The next post in this blog is Stairway-to-Turmoil.